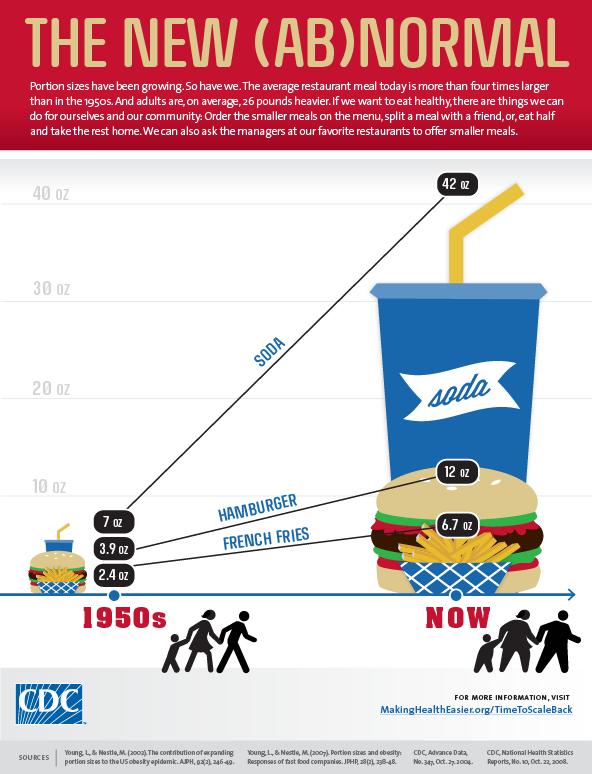 There’s a oldie-but-goodie infographic out there from the Centers for Disease Control and Prevention (CDC) titled “The New (Ab)Normal,” that shows how much the average portion sizes for burgers, fries, and soda have grown since the 1950s. Portion sizes have been growing. So have we. The average restaurant meal today is more than four times larger than in the 1950s. And adults are, on average, 26 pounds heavier. If we want to eat heathy, there are things we can do for ourselves and our community. Order the smaller meals on the menu, split a meal with a friend, or, eat half and take the rest home. We can also ask the managers at our favorite restaurants to offer smaller meals. I often talk to my clients about the importance of portion control, sometimes using the size of dinnerware our grandparents used versus what we use today, this graphic is another great visual for this growing problem. Hit up the CDC page for information on their sources for this data.